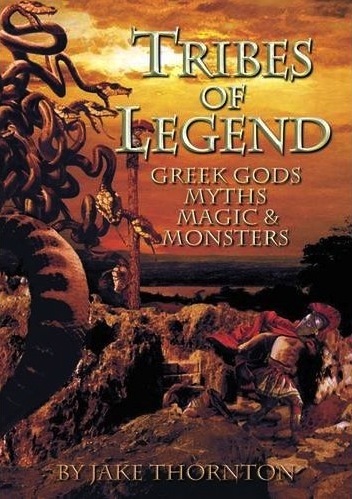 What with Ancient Grudge coming out, Project Pandora being promoted for a week on the Mantic blog, the Kings of War tournament last week and a Foundry Open Day today (where I’ll be running games of Tribes of Legend), I’ve been rather absent from these pages for a bit. I was going to do a photo report for last week’s KOW bash. Sadly my camera decided it was only going to take 5 pictures before it died. I did take a load with Mantic’s snazzy camera, though I think there was a wetware issue there. Anyway, someone a little more competent hopefully took pictures of our slightly cobbled Pandora demo in the evening, which proved rather popular with quite a few of the participants coming back for another go (and another…). Someone described the first scenario from Dwarf King’s Hold Dead Rising as “the heroin for the game”, and I’ve tried to make this equally addictive and replayable. Pandora is looking very snazzy now. The art has a style of its own, the layout and maps are crisp and the toys are great. I’ve seen all the models in the flesh now and had that weird sensation of thinking they were tiny (which is just a reflection of looking at them as pictures on a big screen for 6 months). They’re not tiny at all in reality. Another oddity was how different the Corporation models looked in green, metal and resin-plastic. Exactly the same models, just a different material and colour picking up the light differently. It makes the grey ones look less detailed than the metals, but when they’re painted they look identical. The eye is easily fooled. When I mentioned this to someone they said that this was why Finecast looked higher detail than metal and that it was just a trick of the light. Spray them both the same colour and the difference goes away. Allegedly. Well it’s not anything I’ll be wasting cash testig for real, but if someone has both and could do then it may be worth posting some pictures. It’s going to be a blast. I’ll see if I can get some pictures for those that can’t make it. Of course, if you can make it then do pop along and say hi. This entry was posted in Events, Kings of War, Project Pandora, Tribes of Legend. Bookmark the permalink. Google it. It has been done and for the life of me I couldn’t tell the difference! Thanks for the review Minitrol. A couple of comments to clarify some things you bring up. The skirmish name was originally intended as a convention or club game, and is simplified so you can get lots more people playing without an individual having to wait half an hour for their go. Six players at once was a bit mental, but fun. I think that you’re right that the photography is sometimes too big, and as you point out this shows every fault, however minor. Sizes for these models were based on the sizes you usually see in the Ancient Greek vase art and so on, so minotaurs and cyclopes are generally only a bit bigger than humans and the more exotic monsters are smaller than GW, et al would make them. ToL (battle) was designed to be fast and decisive, and a normal size game plays in an hour or so. The solo game is really a resource management game, and is more like a boardgame than a tabletop. In terms of expanding the games, I’ve written an article to add Amazon chariots and cavalry to the battle game and another is on the way to include more monsters. There’s also an article for monster hunts in the skirmish, just in case the opposing warbands weren’t dangerous enough. Finally, the overall layout of the book might make a bit more sense if you know that it was originally written as 3 separate games/articles, and the background info was added when it was collated. I do understand that it’s not a table top game just in the context of a book to up-sell a new range of miniatures it suffers in comparison to the other parts of the book. Okay the scale makes sense but again some more art to indicate this might have helped. That’s cool to hear about the other plans – don’t get me wrong I would not normally buy a book like this but I am very glad I did. I am looking forward to a big multi player bash as I said so keep watching (I still have to show you my ungor Satyr conversion)! Once I find some time to get a proper page for ToL up I’ll put a link to the review. Whilst it’s always nicer to be praised to the skies, I think it’s only fair to show all the opinions, whatever they are. That’s what I want to see when I’m looking for reviews on a game, so it’s only reasonable I do the same. Thanks! Any areas you feel needed clarification I can add or you could comment. To be fair though the parts I am most critical of you didn’t write (Poor Jez), I am not really into ratings but if it isn’t clear I am happy with the product I can add this in as I wouldn’t want to cause confusion. Ratings are a funny one. I don’t use them in my own reviews as I’d rather people read my opinion. However, I know a lot of people just cut to the chase and look at the numbers. Does one pander to the masses? I just recently received a copy of DKH Dead Rising for my birthday present. I am quite excited about it. I am working busily on painting the minis in that box so I can start some gaming. I refuse to game with unpainted minis. 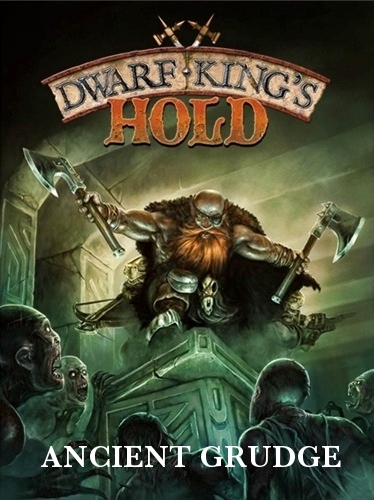 I am really looking forward to trying out Dwarf King’s Hold. I have got a batch of five revenant models sitting on my painting table right now. I feel very eager about this whole project. I remember that somewhere you have images of Alessio’s cavalry munching through my dwarves that weekend. Also I’d just liek to say that Project Pandora was really fun to play (even after 8 quick games) and I can’t wait to get my hands on one. Thanks for bringing it down. Poor Dwarfs! You have my sympathy. On the subject of Project Pandora I think the internal art may have surpassed Dwarf Kings Hold. I love the seventies vibe to it. Will probably end up using it to play Blake’s 7! Does anyone make Blake’s 7 models, I wonder? Just had a look at their site (http://crooked-dice.co.uk/) and they’ve got some intriguing and characterful stuff. Can’t see a full crew there, though you could certainly use a couple of them as proxies. With their 7TV rules, I’m sure they’ll get round to them. Perhaps they’re done but not yet up on the site yet. sorry i could’nt get to see you at Foundry this weekend. My life has many ups and downs at the moment. 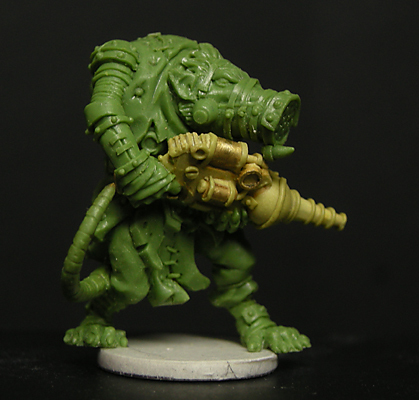 The dirty vermin or should i say 8th race are looking very nice and should look even better with a splash of paint. Must say looking forward to picking a copy of this up. Cheers for running me and the cursed through a game of ToL today. Much appreciated. I’ve been pouring over the book since I got home a few hours ago and I have to say I’m actually most intrigued by the Challenges game. As you yourself say ‘it’s more of a board game’ in terms of being able to play the challenges on your own… but in a wargames format. I’ve often thought about doing something like this myself, so I’m keen to give them a blast. As for ToL the main game, I found it to be quick, easy to pick up and play and with a really simple set of rules. I’m collating my thoughts on it now and working out what I do and don’t like about the game. I think the one thing that I felt might be missing was the ability to ‘double up’ on harder units. It’s a foible of the game and I accept it in the context of the overall rules… but being able to charge two cheaper units into one at the same time would have been fun. Still on the whole it gets a thumbs up from me. Trials of a Demigod (not its original title, BTW) – the challenges game – is a mix of resource management, risk taking and knowing the odds. It’s also got a bit of push your luck, especially with elements like Iolaus. So yes, rather more of a board game vibe. It’s a shame that you couldn’t stay longer to watch the next game because the double attack is exactly what the next Centaur player did. Having seen quite how hard Hippolyte’s Guard were from the front while he watched your game, he outflanked them then attacked first in the rear, then in their flank in successive activations: a double attack on a hard unit by two weaker ones (which killed it). This kind of coordination is possible in a couple of ways. Most obviously, you can use the Hand of the Gods card that allows you two activations in a row, but in this case he’d been more cunning. He used the fact that he outnumbered the enemy to ensure all of their units had activated whilst keeping his flanker’s actions back. Only when the Amazons had no units left to move did he pounce. That makes it sound like the other player was a bit foolish, but in reality the game was right up to the wire by that point. Both sides need only a single unit kill to win, and the Centaurs had a unit within a double shot of the remaining Amazon Archers. He’d need to be lucky, but a really good roll could have won it for them. It was about his only shot (if you’ll pardon the pun), so he took it first rather than passing. The Guard moved to try and put themselves out of range of a charge. By that point they could no longer position themselves so that all their enemies were to their front – someone would get a flank or rear charge against them. Ahh yes I thought that was probably the best method. Are you going to do a living FAQ for Project Pandora? I’ve had it for a week now and I’ve got a couple of questions. #1 – Can a Corporation model reaction fire at a Veer-myn that moves into a square adjacent to him? Say the Veer-myn has dodged and is trying to move back into position. #2 – Can a Corporation model shoot at a Veer-myn in an adjacent square using a shoot action instead of fighting with a movement action? #3 – Can a Corporation model shoot at a distant Veer-myn if there is another Veer-myn in an adjacent square? My interpretation – based on the 4th paragraph of page six is no, no and yes. Am I right? Thanks and other than this little confusion, the game is great! Thanks Jake – what a quick response!